Putting a price tag on car insurance has always been something of a guessing game. Insurers can’t monitor your driving round-the-clock, so they set rates using predictive factors such as your age, gender and history of crashes and claims. But some insurers have drawn up plans for analyzing risk that may change how they charge for auto insurance. Allstate recently became the latest insurer to file a patent application for a new pricing system that charges customers based on the riskiness of each trip — joining competitors such as State Farm and Travelers Insurance, which have made similar patent applications. Here’s the idea: Using sophisticated tracking technology, a company would be able to customize drivers’ rates for each trip according to which roads they choose, what time they drive, the weather and who’s in the vehicle, among other factors. You could check the recommended “cheapest,” aka less risky, route via your smartphone or other device. While it remains to be seen what specific technology emerges, companies are signaling how auto insurance pricing might evolve with these patent applications. For most drivers, picking how you’ll get from point A to point B doesn’t take much thought. 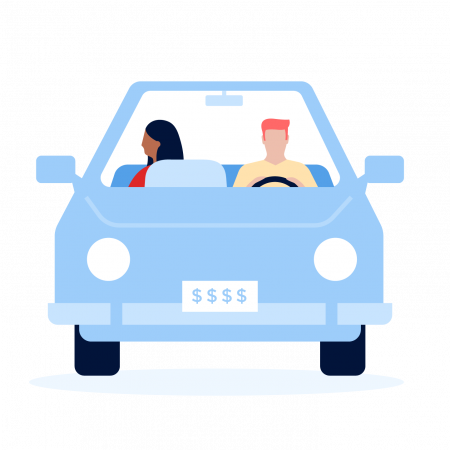 But under trip-based car insurance, you’d have to weigh route choices carefully — or pay a higher insurance price for the trip. Allstate’s application to the U.S. Patent Office, called “Route Risk Mitigation,” proposes assigning “risk values” to stretches of road based on information such as traffic, accident patterns, geographic traits, weather issues and more. For example, turning left at a particular intersection rather than going straight or right could be deemed more risky, based on the accident history at that intersection. Road segments with higher risk values would carry higher insurance costs if you drive on them. The goal is to “promote and reward risk mitigation” among customers, according to the patent. In essence, you could end up planning trips based on how much you’re willing or able to spend. Instead of buying a six- or 12-month policy, you’d buy “risk units,” and you’d have to monitor how fast you’re using them up. For instance, the fastest way to your destination may be riskier, and thus more expensive, than slower routes that your insurer recommends. You would have to decide whether the convenience of a shorter drive is worth burning through your risk units and having to buy more units sooner. Travelers Insurance describes a similar system in a 2014 patent application. Instead of assigning a risk value to road segments, however, the company proposes naming various “risk zones,” areas rich in accidents, police activity, insurance losses and other issues. Risk-zone data, Travelers notes, could be used to determine whether drivers would face surcharges on their rates or discounts if they routinely avoid danger. The time of day you typically drive. Poor driving behavior, such as swerving or tailgating. How often you stop during trips. The typical passengers or cargo you carry. The typical length of your trips. The end of traditional insurance premiums? Buying car insurance in risk units would benefit drivers who can stretch their units over long periods. Low-mileage motorists, for example, would make ideal candidates, says Jared Smollik, actuarial director at Verisk Insurance Solutions, an analyst group. Allstate also mentions the idea of a “pay-as-you-drive” system. With this model, instead of selling drivers risk units in advance, the company would add up the combined risk value of all your trips and charge you accordingly at the end of your billing cycle. Another possibility, Smollik says, is that insurers will still sell traditional fixed-term policies and offer trip-based policies as an incentive for better driving. Insurers might offer discounts to customers who consistently drive responsibly and choose the safest routes, he says, without overtly penalizing other drivers who don’t fare as well. Smollik acknowledges it probably will be years before our vehicles have the necessary technology to support this new insurance pricing system. But he points out that current usage-based programs already can give drivers a rough sense for what a trip-based policy might be like. Several companies already offer such programs, which track behaviors such as speeding and hard braking and use the results to refine drivers’ insurance rates and give feedback on their driving habits. Customers who test the waters with usage-based insurance may realize its benefits, he says, and find it easier to transition to pricing based on trips or risk units. Half of drivers already accept usage-based insurance when it’s offered, and many more are interested in how tracking devices might benefit them, according to a 2016 study by LexisNexis. The bigger roadblock to implementing trip-based insurance is the challenge of collecting enough information about roads to accurately rate their risk level, as Allstate is considering. It’s a long and impractical process, Smollik says, because of the amount of observation needed. So for now, insurers will have to make do not knowing whether we took Quiet Court or Rocket Road to Grandma’s house, although it appears they will be able to in the future.